(Nanowerk Spotlight) By now you have probably read a lot about gecko-inspired nanotechnology and about researchers' quest to come up with a gecko-mimicking super-strong dry adhesive (see our Spotlight: "Self-cleaning nanotechnology stickies"). Scientists are intensely researching how animals like spiders and geckos generate the high adhesion force that allows them to cling to walls and walk on ceilings, feet over their head. 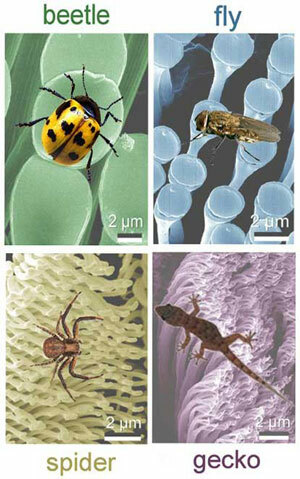 While this research so far has focused on novel materials like carbon nanotubes to replicate spider feet and gecko toes, a key challenge for materials engineers is the scaling up of such materials from small animals to, say, spiderman gloves that support a fully grown human. Complementing the ongoing gecko biomimetic materials research, Nicola M. Pugno, an Associate Professor of Structural Mechanics at the Politecnico di Torino in Italy, has developed a theoretical framework that he calls Adhesive Optimization Laws. "Improving our ability to scale up the fantastic material properties that we observe at the nanoscale is a major challenge in nanotechnology research," says Pugno. "The Adhesive Optimization Laws are taking into account the role of structure and defects and would allow us to design an optimal geometry for scaled up adhesive materials. If the laws are violated, doubling the contact surface will not double the adhesion force; if they are satisfied the force becomes theoretically proportional to the surface area." In a recent article in NanoToday ("Spiderman gloves"), Pugno lays out the development of his Adhesive Optimization Laws and gives a practical example of fabricating 'Spiderman' gloves that are capable of supporting about 10 kilograms each on vertical walls. According to Pugno, theoretical van der Waals gloves could generate an adhesion force comparable to the body weight of about 500 men. "Even if such a strength remains practically unrealistic – and undesired, in order to achieve an easy detachment – due to the presence of contact defects, e.g. roughness and dust particles, its huge value suggests the feasibility of 'Spiderman' gloves. Although the scaling-up procedure is expected to decrease the safety factor (body weight over adhesion force) and adhesion strength, they however could remain sufficient for supporting a man." Pugno has conducted adhesive force-displacement curves with living geckos on either glass or PMMA surfaces and found that the actual safety factor of about 10 is one order of magnitude smaller than its theoretical value. He notes that this strength reduction actually is beneficial in order to achieve an easier detachment but still accomplish safe attachment. "Thus, contact imperfections and related size effects could be, at least partially, smartly controlled, suggesting that Spiderman gloves are not in the domain of science fiction but rather a challenge for current, bio-inspired nanotechnology," says Pugno. As a proof-of-principle, Pugno and his group have fabricated a triangular surface of 6 cm wide and 5 cm high from a new, commercially available viscoelastic ultra-soft material ("gecko skifell"). By imposing a nearly uniform shear stress distribution, they were able to suspend ∼10Kg on each glove (with a detachment force nearly two orders of magnitude smaller), adhering on flat surfaces of glass or wood. Researchers have already demonstrated that vertically aligned arrays of single-walled carbon nanotubes, measuring 4x4 square millimeters, have a much higher achievable macroscopic adhesive force, 29 Newton per square centimeter, than natural gecko feet, which achieve about 10 Newton per square centimeter (see our Spotlight: "For super-strong nanotechnology dry adhesives look no further than the gecko"). What this means is that only 150 pieces of these small carbon nanotube arrays, with a total contact area of about 5x5 square centimeters – which is much smaller than the palm of your hand – would be needed to collectively hold a person of ca. 70 kg. Pugno says that in order to design and fabricate an optimized adhesive material, the two size effects of adhesion strength and safety factor need to be properly balanced and that requires an optimized structure. The new Adhesive Optimization Laws will further facilitate the design of novel smart materials that can control adhesion.